Warning: These are graphic pictures of a Featherweight in extreme duress. Last week a friend asked me to clean her Featherweight. She warned me that it had not been cleaned in a while and that several raggedy quilts had been made on her for Christmas. So I thought I had prepared myself mentally for what was to come. Imagine my surprise when I opened the case and found an almost completely white machine! My jaw must have hit the floor! Luckily, only Dickens was a witness. Here you see her as I was starting the recovery process. See on the arm, that black spot? 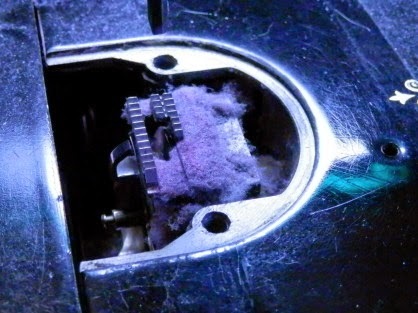 That's where the linty fibers have been disturbed. I have partially disassembled her, as evidenced by the miscellaneous parts surrounding her, and the throat plate is off. I know, it makes you want to hide your eyes and shriek like a soap opera star! In case you were not horrified enough by the previous picture. A view from the bottom. 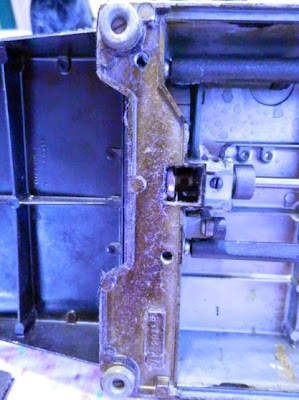 See all the dust clinging to the metal between the feet? 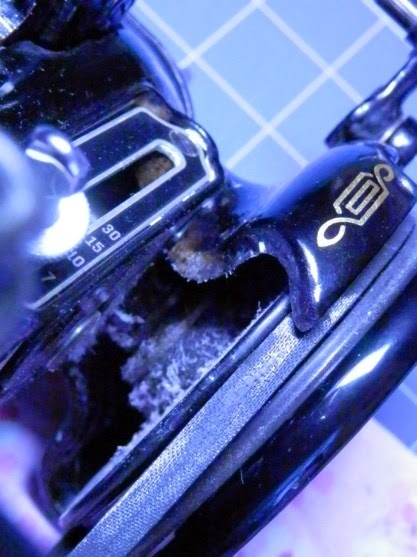 And this is something I had never come across: When I tipped the machine back, this is what I saw under the hand wheel/bobbin winder area! I am pleased to say that she survived the recovery process and is now fully functional, lint-free, and shined to within an inch of her life. 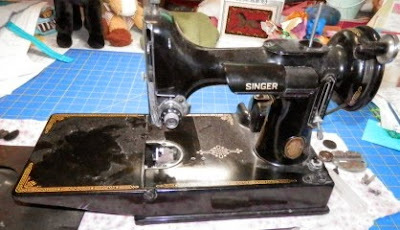 New needle, lots of oil and lubricant, a container of canned air--she breathed a sigh of contented relief and purred as she made perfect stitches. The moral of this story? 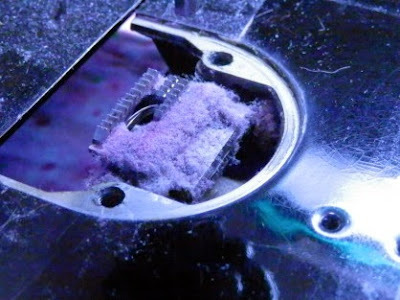 When did you last clean your machine--whether a Featherweight or something else? New needle in the last eight hours of sewing? Just sayin'. My motto: If you can't be a shining example, you can serve as a horrible warning. My horrible warning person has been chastised and has promised to never do this again as long as I keep her identity a secret. Last month I made a trip to Northeastern Ohio--Cleveland! Since I spend so much time commuting every week, I am a firm believer in taking the fastest routes possible. In this case, I was able to see both Lake Ontario and Lake Erie. Along the waterfront in Cleveland, there is a huge building with sea life painted on it. My brother told me he and another tractor-trailer driver were driving along the same route one day. He was on the CB radio with the other driver's young son and he asked him if he could see the "aquarium" by the lake! Of course, he could, and then his dad had to explain that it was just painted on the side of the building! It really is stunning! But, sightseeing aside, I was really going to spend time with the North Coast Needlers Quilt Guild. 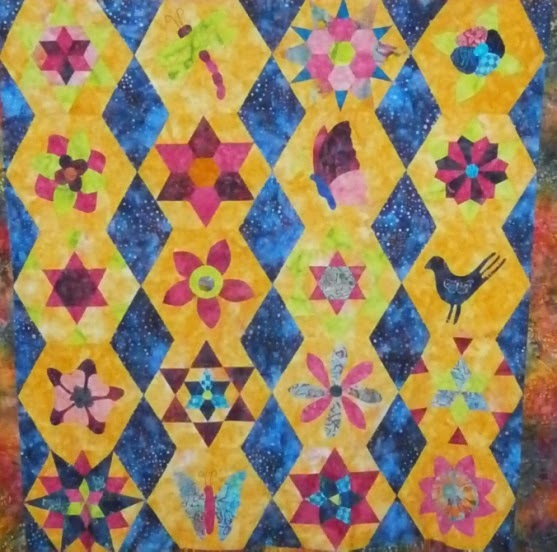 Their show had been the previous weekend, and members brought their quilts so that everyone could see who had gotten ribbons! OMG! These quilts were phenomenal! There is a lot of talent in that guild! And I had to go on after that show and tell! It was a ton of fun! I bring a selection of my quilts, spanning my entire quilting career, and tell their stories. Some are funny, some are more serious, but it's easy to relate to my journey through the quilting world. "The school of hard knocks is an accelerated curriculum", and I am in the PHD program! The next day Elaine, Martha, Maryann, Patt and Phyllis joined me for an advanced applique class, where they learned to make 1/8 inch bias stems, sharp points, invisible applique stitches and much more. We had an absolute blast--thank you, ladies, for sharing the day with me. Martha took me on a driving tour of Cleveland just before dusk. She is so proud of her hometown, and she knows its history and shared many types of neighborhoods with me. Rumor has it that Cleveland has a church on every corner--and when viewing the lighted steeples after dark, it's easy to believe. Thank you, Martha, for sharing with me! It was a most excellent adventure! On the trip home, coming across Pennsylvania and into western New York, I was reminded of my last trip to Ohio, which took place in the fall. At that time, the grapes were ready for harvesting and the air was redolent with their fragrance. This time, the leaves were just bursting forth on the vines, starting the cycle again. Have I mentioned recently how lucky I am? P.S. I am listening to "The Invention of Wings" by Susan Monk Kidd. Laurie, you are right, I'm hooked! My goal for marking my quilts is to have absolutely no marks left behind. I have a few favorite markers, and today I am showing you an easy way to mark with a Clover Chacoliner. 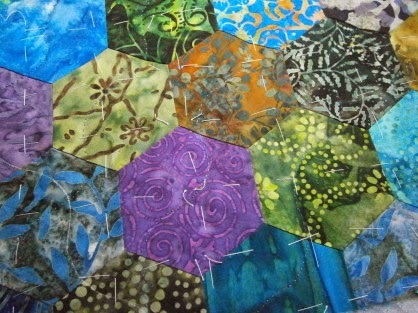 This is a smallish hand-pieced hexagon (duh!) quilt. I have finished the quilting in one direction and have started to mark the other. You can see a marked line in the lower left corner. You can also see some of the quilting lines. Here you can see the quilted lines more easily. I am using a variegated YLI Fusions thread in 24 weight. Makes a strong statement, which for this quilt I love. And here as well. The lines move from the lower left to the upper right through the middle of the hexagons. 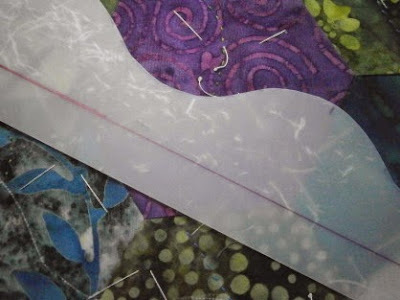 I cut paper into a scallop design and then transferred it to plastic. It's easier to trace along the firmer edge. Notice the straight line about in the middle of the template. That's my leveling line. Leveling line, you ask? 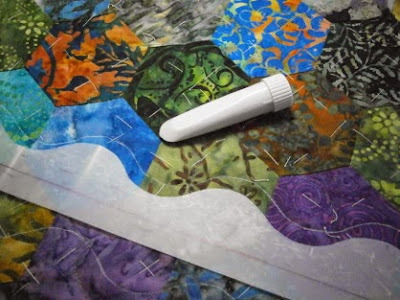 Although I am not making perfectly parallel rows of quilting lines, I do want them to be in about the same place on each row. (The hills and dales do not line up from one row to the next.) Look closely at the line and the hexagons below it. I know it's hard to see, but the line aligns with the hexagon "innies". Easy, right? I use the chalk marker (white only!) to race along the edge of the plastic. I have moved the template over so that you can see what I did more clearly. This shows several lines of quilting marked and you can also see how these lines are intersecting with the lines already quilted. 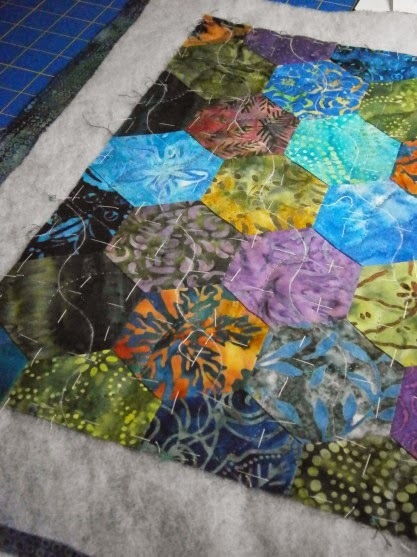 It makes for an "organic" feel to the quilting. 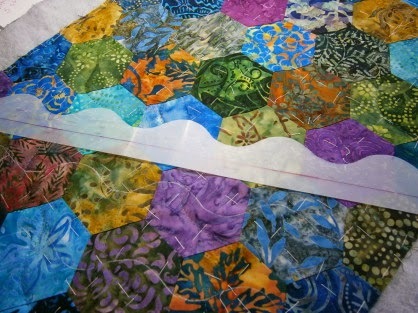 I'll post another picture when the quilting is done and the binding is on. The chalk will be gone when I am done quilting, or I can use a damp cloth to finish the job. Other colors of chalk contain dye and can leave a truly lasting mark. P.S. Yes, I do a lot of basting. My grids are usually 1.5 inches apart with smallish stitches. 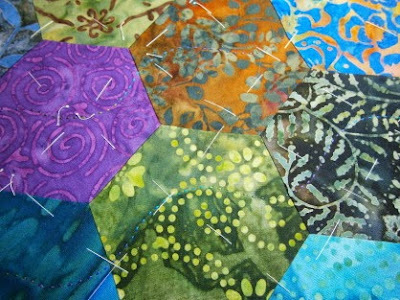 I quilt without a hoop or frame and without poking my underneath fingers. The amount of basting helps keep the quilt flat. P.S. I am listening to Hot Pursuit by Stuart Woods. Last year Traci was in my Monthly Bliss Doubled class. 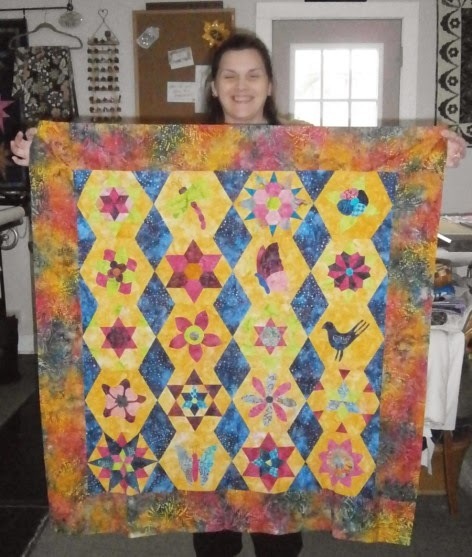 The perfect combination of hand piecing and hand applique, this beauty is absolutely stunning with Traci's fabric and color choices. Here you can see the details better. Thanks for sharing, Traci! Spent time outside raking and picking up. Just a beautiful day. P.S. This will seem like an odd question, but...for those who have Jeep Grand Cherokees, do you prefer All Wheel Drive or Four Wheel Drive. And why. Just curious. No wrong answer! Thanks! My mom and I spent the day together doing errands and then we went to our favorite greenhouse, Grisamore Farms in Locke, NY. We got fabulous pansies, begonias, citronella geraniums (supposed to repel mosquitoes), and fuchsias. 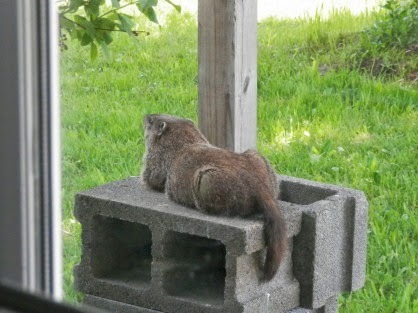 Normally we wait until later in the season, when it is more appropriate to plant. But we often find ourselves with a limited selection when we wait, so today we went. They've only been open for the season for a couple days. 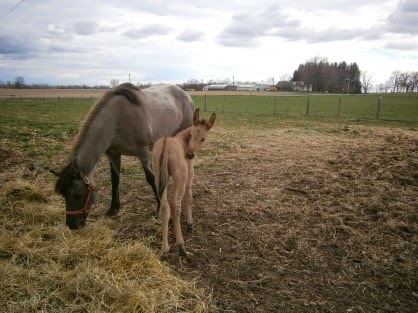 As we were driving back past the farm store, I spied the mare and then...the foal! I had to stop and pet the horses! 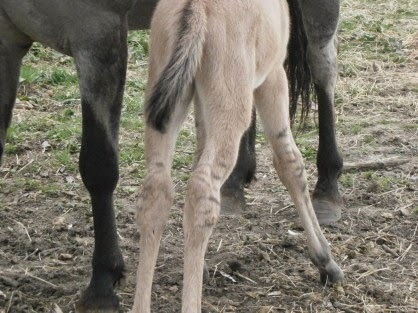 Interesting markings on the legs, plus the stripe down the back. "But I am soooooo cute...just ask me!" 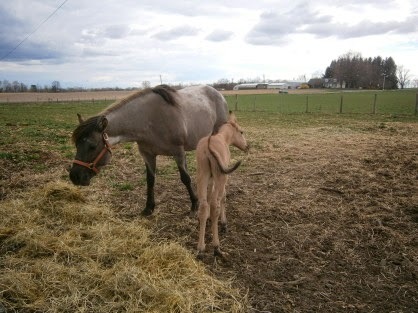 After I had turned off the camera and gotten back into the car, that foal "smiled"--several times! With the striped back, the leg stripes and the longer ears, I'm thinking there may have been some hanky-panky in the paddock! I did a bit of internet research, but didn't find any definitive answer. Do any of you know? 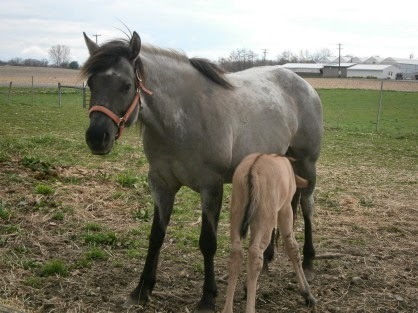 So I had my horse fix today! 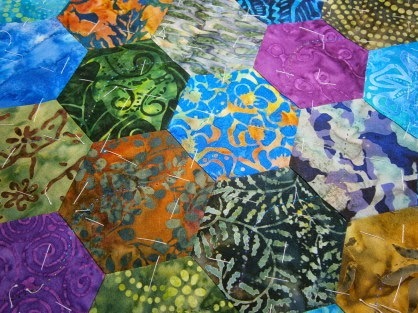 And did a bit of hand quilting. A good day! Hope yours was too! P.S. I am listening to NYPD Red 3 by James Patterson.